The online threat landscape continues to evolve. Not only do we need to continue innovating and refining our protection techniques, but we also need to stay on top of our cybersecurity education in order to protect each other from these attacks. As it happens, a number of people still don’t use any cybersecurity on their personal devices. To better understand these patterns, and to help create a cybersmart community as more aspects of our daily lives become internet-connected, we took it upon ourselves to gather data from home users in the form of a survey. First, how many people use cybersecurity? We found that 14% of users surveyed don’t use any cybersecurity protection whatsoever. Sure, we could tell you all you should be using our cloud-based SecureAnywhere® protection, but, in all honesty, it’s more important to us that people protect themselves in the first place, whether they’re our customers or not. 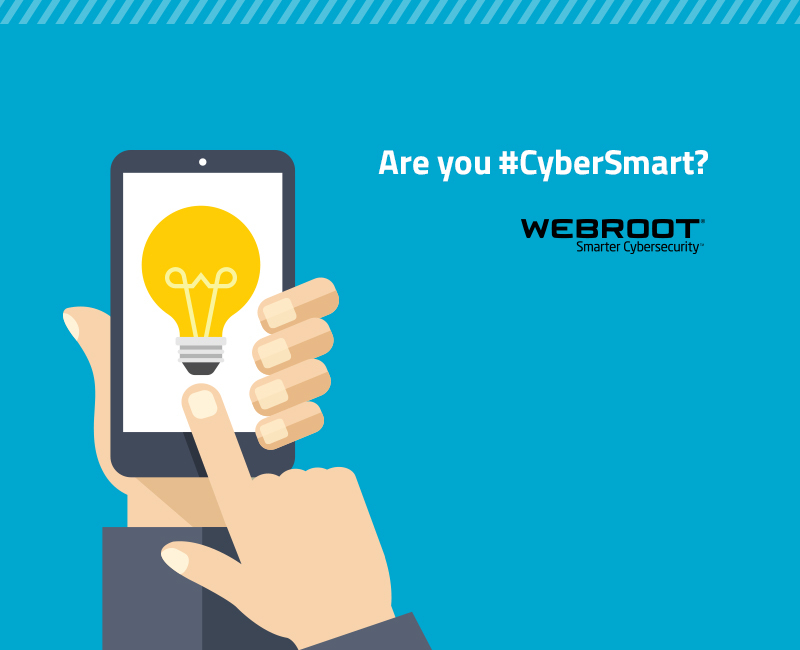 You can help your friends become CyberSmart by sharing this blog or by sending a Tweet to your network. Foregoing an antivirus solution and neglecting to layer your cyber defenses exposes you to an ever-evolving barrage of malware and phishing, not to mention SQL injection, cross-site scripting, and man-in-the-middle attacks. No matter which protection you choose to use, we recommend taking a few simple steps to minimize your risk of being targeted by attackers. Enabling automatic updates for your operating system, apps, and programs, and layering your Wi-Fi security are easy but effective ways to close the gap. Also, be sure to use strong, unique passwords for your sensitive accounts. Although you’ve probably heard that one before, you’d be amazed at how many people still reuse passwords between various accounts, including their banking and other financial logins. Nearly half of users in our survey admitted to reusing their passwords. If you’re one of them, and you find yourself thinking, “but I have so many logins and it’s too hard to remember all my different passwords,” we understand. We’ve all faced this question at one time or another during the internet age. But you can use a secure password manager to ease the burden of having to keep track of so many credentials. Whether you’re already part of the family, want to take Webroot SecureAnywhere® for a free test drive, or purchase for 25% off, we provide an online management account where you can centrally control your various connected home and mobile devices (and also manage your passwords.) If you haven’t already, take advantage of our advanced protection features today by setting up your My Webroot Anywhere account. When will you have a smartphone (iPhone) app which will protect my iPHone? Mose, Apple manages the Security of their mobile devices through the system updates they release quite often. 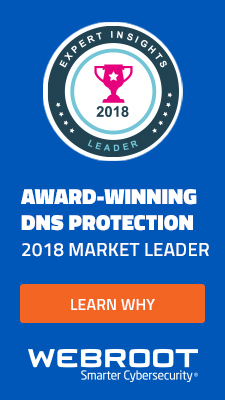 I have Webroot security on my three computers for several years, and feel very comfortable. How do I extend it to my iPhone ? Thanks for the feedback, Barry! Apple actually handles the security for their mobile devices through their built-in system updates they release fairly often. we have been using WebRoot for many years now and really appreciate all you do to keep us from Cyber bullies, scams, malware etc. every time someone asks what do we use, we give them your name ans a review. We really appreciate everything you do to promote Cybersecurity, Tony! I am not sure what I have unprotected. Judith, what devices do you currently use and which ones have Webroot running on them? I thought my cell was included. I just. Need help to set up. I need help scanning my computer. Joanne, your mobile Apple devices have security measures in place through the updates they release each month. I have an account with Webroot check to see if I have this program already. If so how should I set up this protection system? Roosevelt, I’ve re-sent you the download instructions to your email. They will walk you through exactly how to set-up your Protection. What is the price before and after the 25% off offer? I thought this came with my Comcast account. Gerald, it looks like you paid for a 3 year renewal with us back in 2013. I’ve re-sent you the download instructions to walk you through covering your Windows 10. I got hit with a virus in spite of having an antivirus program installed. Geek squad to 6 days to fix and of course I lost all of my data. In spite of having auto update they still managed to cost me time and money and the loss of all my studies and sermons. I do deeply apologize for all the inconvenience it sounds like you’ve been through, Joseph. I am already a web user but would like to know more about managing my passwords. Also how do I get webroot on my iPad, I have it on my laptop. YOU ARE GREAT! Thanks for watching out for all of us Webroot customers! There is nothing on my phone so why should I care about protecting it? Wayne, anything you search or do while on your Phone could potentially be spied on by Intruders. This includes all shopping, online banking, etc. Hi, I would like to learn how to be cyber smart. In the meantime, I have your protection package on my MacBook Pro, but I don’t know how to get it on my iPhone and my iPad. I would appreciate your help. I believe when I bought your program it promised to be usable amongst the three. 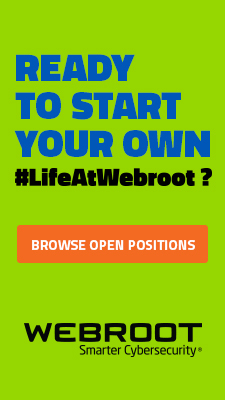 For learning more, I highly recommend registering and checking out our Webroot Community. From there, you can ask questions and find answers to various topics just by searching for them! We started using Webroot a couple of years ago and we have been pleased with it. We have it on our laptop and our tablet. There is a security of some sort on our phones as every time we download something, we get a notice that our phone scanned it and it is ok or not ok.
As one of your customers I value and thank you for your timely news letters and alerts. It is much appreciated. Thanks, appreciate your effort and info however, I hope some day you reach my golden years and find how these messages are received in our over used and tired minds, in case you missed it, I’m including you and my techie sons who think this is all so wonderful. I’ll keep my webroot and trust you and your colleagues to do their jobs and protect us. No wonder there are so many stolen identities….it seems to me if people are not impacted they don’t care. How do I place my webroot on my iphone? I’ve been using webroot for the last few years and haven’t had any issues whatsoever. It’s not like alot of security software that boggs down your devices or slows down you system with stuff you don’t need. I’m satisfied with webroot for the money. Thank you for your protection. Can I download my Webroot security onto my cell phone? Would you please tell me what level of software security do I now have with Webroot and when is the renewal date? From the emails I get from Webroot, it looks like I don’t have any coverage in place. You currently have a Complete subscription which is the highest level of protection we offer. It is not set to expire until 10/5/2017. I would like to take advantage of your 25% off, but I just renewed for 2 years. I am sometimes the offender of using the same password for various accounts. Tell me about a password manager you would suggest. Thank you for the offer and information however at 88 years of age all the talk of Cyber space etc is completely beyond me and I have nobody who can put me right. I installed Webroot for that reason and will have to leave it at that. In an era where Yahoo has scores of millions of accounts hacked and Target is in itself a target, why should I trust any online service to store all of the passwords for all of my accounts? I recently shut down my Twitter account because of its tie-in with Yahoo. I also have stopped using my Yahoo email account and have started looking for an alternative email provider to send commercial (shopping) email for activities such as placing online orders. How much will it cost me! Elizabeth, our Sales Team will be happy to help you! I have Webroot Anywhere but find that when I change a password with an email request from the site, Webroot keeps trying to login using my old password. Webroot needs to make it sensitive to when you’re using a new password and ask to update your account every time. Sometimes it works like that but not always. Thanks. I sincerely apologize for the inconvenience, as I do know how annoying that can be. I have been so extremely satisfied with your service since the get go……many thanks for peace of mind!! I have been covered by Webroot SecureAnywhere for a number of years. I intend to renew my coverage shortly. It will be coming due shortly. After my first PC crash a tech installed Webroot. About a month later it crashed again and Norton found a Trojan Horse. (Don’t know where Norton appeared from.) Now I have no scroll bar, task bars and other items I use on my email and printing. I can’t afford that tech again. Can you help? I have been using Webroot Anywhere for several years, and have found it to be very reliable! It has a small footprint and will not hog your memory! Updates are automatic and the scanning in the background will not interrupt your operation! I am one of the people who use to use the least number of passwords possible, but with Password Manager, I have no problem! I have used a few cybersecurity programs in the past, but my go to program has been Webroot! I highly recommend their products! 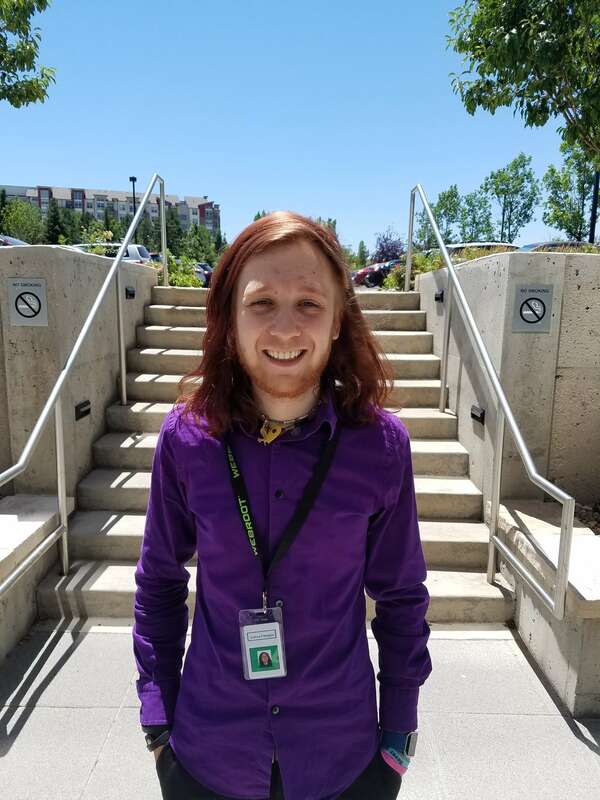 Hi Richard– I am a long time user of Webroot, but due to lazy habits have never taken the time to set up Password Manager; thanks to your post, I’ll sign up for it today. Our Password Manager is an add-on you can get in your browser that will ask you if you want to save a password each time you sign-in to a site. If you do, it will be stored safely and secure in your account and can be accessed from any device you sign-in on. Webroot Anywhere does a very good job, except they do miss a few things, items like DNS UNLOCKER VERSION 1.4. IT got into my granddaughter’s laptop and I haven’t been able to get it out. when trying to use the computer, it is constantly throwing ads and redirects, causing computer not to be usable for anything. what about my cell phone ???? It’s not surprising to me that 14 percent of internet users in your survey don’t use any cybersecurity programs at all. But you don’t mention what proportion of that 14 percent are Apple Macintosh users. There is a persistent belief among Mac users that all malware and viruses are Windows-based and don’t target Macs, thus they have no need to have cybersecurity programs installed on their Macs and iPhones. While it is true that Macs now make up less than 20 percent of all desktop and laptop computers now in use — and that Windows-based software is incompatible with the Macintosh operating system (and vice-versa) — Mac users are being foolish if they believe that cybercriminals, hackers and cyberterrorists aren’t developing viruses and malware that specifically target Macs and iPhones. There have also been recent news reports about malware and viruses attacking Linux-based devices, so no one without cybersecurity software is safe. While Macs and Linux devices have pretty much been relegated to the exclusive world of what I call “cybersnobs” who hate Windows with a passion (And frankly, who can afford a Mac these days? ), the same cannot be said of iPhones, which are not only Apple’s biggest moneymaker, but occupy a huge share of the mobile market. So it no longer matters if you use a Windows, Mac or Linux computer — whether a desktop PC a laptop or a tablet. It doesn’t matter if you use an iPhone or an Android phone. If you don’t have cybersecurity software loaded on your device, it’s a sitting duck. I have a Windows laptop and an Android phone, and I have both loaded with Webroot, AVG, Malwarebytes and Comodo. Since no single cybersecurity program can stop all threats — it’s wise to have more than one cybersecurity program on your devices. 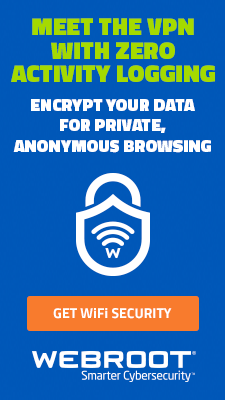 For extra protection, it’s also worthwhile to use a virtual private network (VPN) — especially if you rely on free, public Wi-Fi networks, which are highly vulnerable to hackers (I strongly recommend the CyberGhost VPN). Having a cybersecurity shield is good and necessary. Having multiple shields is even better. You can download our free security app to cover your mobile phone, Judith. I use My Webroot Anywhere on my PC but does an iPhone 6 require one? Robert, the security for iPhones is included with the system updates that Apple releases frequently. I have told many of my fellow lawn-bowlers, acquaintances and friends about your security programme and advised them how good it is and they should be using it. Tried to set up a Webroot Anywhere account, but it was rejected because Webroot said my security code was already taken. Yes, by me! I have it written on an email from Webroot. Nothing I can do to change it. So I’m giving this up as a waste of time. Sincere apologies for all the trouble, Carolyn. 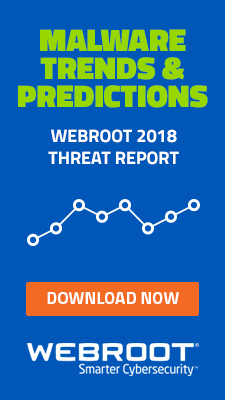 We have used Webroot for years on our business desk top computer. FINALLY – we stopped having problems with slowness and viruses. It is so simple to use and the Webroot people provide excellent customer service if you ever need to discuss an issue with them, like billing, etc. I have recommended Webroot to many people – the cost for the value of this product is fantastic! Thank you, Webroot! I am not familiar on how to get or use Password Manager. Some of my accounts have numerous passwords that are needed and have top be coordinated. You do provide a great service..